FAVOURITE. Big Bear has been priced up at 2-1 to win the Grade 2 Investec Dingaans at Turffontein on Saturday. Betting on Saturday’s full Turffontein card for the Sansui Summer Cup meeting is now available and there could be some decent prices on offer. The R2-million Summer Cup tops the card and Betting World have Mike de Kock-trained Orchid Island as the 13-2 favourite but the betting for the Grade 1 race over 2000m on the Standside card remains very tight with 13 of the 20 runners lying between 13-2 and 14-1. De Kock is looking for a 10th Summer Cup victory and will be relying on Orchid Island and Anthiny Delpech to do the job for him. 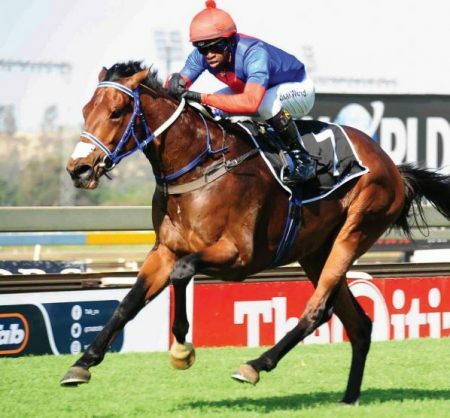 Crowd Pleaser has a lot going for him other than the track as trainer Johan Janse van Vuuren’s main concern is that in the long straight they will be able to run him down. Geoff Woodruff has won the last four running s of this race and with two earlier wins – El Picha and Eventuail – he will be looking for a sixth win. Woodruff has a three-pronged attack with Pagoda (JP van der Merwe) Banner Hill (Grant van Niekerk) and Master Switch with Pagoda the most fancied of the trio at 8-1. TAB will open betting on the meeting on tomorrow but already the good news for bettors is that the Net Pick 6 carryover has been increased a further R500,000 to R1.7 million and now the estimated pool is now R6 million. The Investec Dingaans over 1600m for three-year-olds is another popular event on the card and Big Bear, winner of the Emperors Palace Ready To Run Cup on Charity Mile day, has been priced up as the 2-1 favourite to win this event. However, he does have as good a draw as last time as he will jump from barrier No 12 this time. 10-1 SHIVERING SEA 12-1 MY FRIEND LEE, ALILEO, LA BELLA MIA, FAVOUR`S PRIDE 14-1 DARING DIVA, KILAUEA 16-1 AND UPWARDS OTHERS RACING ASSOCIATION HANDICAP (LISTED) 5-2 FORTISSIMA 6-1 GONE BABY GONE 7-1 SAVE THE RHINO, RUN RHINO RUN 8-1 COOL CHARDONNAY 11-1 ROYAL HONOUR 12-1 STORM WARNING, BONDIBLI 14-1 AND UPWARDS OTHERS.